Preparing Garden Soil for Planting | mizzeliz – working for you..
Organic soil is rich in humus, the end result of decaying materials such as leaves, grass clippings and compost. It holds moisture, but drains well. Good organic soil is loose and fluffy — filled with air that plant roots need — and it has plenty of minerals essential for vigorous plant growth. It is alive with living organisms — from earthworms to fungi and bacteria — that help maintain the quality of the soil. Proper pH is also an essential characteristic of healthy soil. So, how do you know if your soil is healthy? And what do you do if it isn’t? Of the 17 or so elements thought to be essential for plant growth, nitrogen, phosphorus and potassium are the most important. They are known as primary or macronutrients because plants take them from the soil in the largest amounts. Fertilizers that contain all three of these nutrients are labeled complete fertilizers, but they are hardly complete in an absolute sense. Calcium, magnesium and sulfur, known as secondary nutrients, are also important to many plants. Lesser or micronutrients include boron, copper, iron manganese and zinc. Some micronutrients have specific functions such as cobalt, which isn’t used by most plants but helps legumes fix nitrogen. Another critical component of your soil is its acid-alkaline balance or pH reading. All these essentials — and the proper texture — makes for healthy soil. One way to determine what minerals are lacking or abundant in your soil is to get it tested. Local Cooperative Extension Services often offer low cost soil tests. These tests usually measure levels of soil pH, magnesium, phosphorus, calcium, potassium, and sometimes nitrogen. They may also report the soil’s micronutrient content, but this isn’t essential to the gardener who adds plenty of organic matter to her soil. For a less intensive test, pick up a do-it-yourself version such as the Rapitest Soil Test Kit and do your own simple, rewarding chemistry. pH levels can be critical to your plant’s ability to absorb nutrients. Most minerals and nutrients are best available to plants in soils with a pH of between 6.5-6.8. If your soil is acidic (low pH, at or below 6.0) or alkaline (high pH, above 7.0) it doesn’t matter how rich it is in nutrients, the plants won’t be able to absorb them. pH is usually included in a soil test, or you can buy a pH Meter and determine the acid-alkaline balance of your soil on your own. The best time to get the soil tested is in the spring or fall when it is most stable. This is also the best time to add any amendments or organic fertilizer should your soil fall short of minerals or nutrients. In addition to uncovering your soil’s pH, macronutrient content and mineral levels you’ll want to examine its texture. Soil texture depends on the amounts of sand, silt and clay it holds. A handy description of the three main soil components and an easy test to determine your soil type can be found at NASA’s Soil Science Education Page. Sand constitutes the biggest pieces of soil particles and feels gritty to the touch. Next in size are the silt particles which are slippery when wet and powdery when dry. The smallest pieces are clay. They are flat and tend to stack together like plates or sheets of paper. You don’t need an expert to determine soil texture. Just pick up a little and rub it between your fingers. If the soil feels gritty, it is considered sandy. If the soil feels smooth like talcum powder, it is silty. If the soil feels harsh when dry and slippery and sticky when wet, the soil is heavy clay. Most soils will fall somewhere in between. Sandy soils tend to be nutrient-poor since water and nutrients rapidly drain through the large spaces between the particles of sand. These soils also tend to be low in beneficial microbes and organic matter that plants thrive on. Silty soils are dense and do not drain well. They are more fertile than either sandy or clay soils. Heavy clay soils are quite dense, do not drain well and tend to be hard and crack when dry. Because there isn’t much space between the clay particles, there usually isn’t much organic matter or microbial life in the soil. Plant roots have a hard time growing in the hard material. Just like humans, plants need air, both above ground for photosynthesis and in the soil as well. Air in the soil holds atmospheric nitrogen that can be converted into a usable form for plants. Soil oxygen is also crucial to the survival of soil organisms that benefit plants. Good soil provides just the right space between its particles to hold air that plants will use. Silty and heavy clay soils have small particles that are close together. These dense soils have little air. Sandy soils have the opposite problem; their particles are too big and spaced out. The excessive amount of air in sandy soil leads to rapid decomposition of organic matter. Adding organic matter, especially compost, will help balance the air supply (the perfect soil is about 25% air). Also, try not to step in the beds or use heavy equipment that can compact the soil. Avoid working the soil if it is very wet. All forms of life, including plants and soil organisms, need water, but not too much or too little. Healthy soil should be about 25% water. In soils with too much pore space (sandy soils), water quickly drains through and cannot be used by plants. In dense, silt or clay soils, the soil gets waterlogged as all the pore space is filled with water. This will suffocate plant roots and soil organisms. The best soils have both small and large pore spaces. Adding organic matter (see below) is the best way to improve the structure of your soil through the formation of aggregates. Additionally, organic matter holds water so that plants can use it when they need it. A healthy organism population is essential to healthy soil. These little critters make nutrients available to plants and bind soil particles into aggregates that make the soil loose and fluffy. Soil organisms include earthworms, nematodes, springtails, bacteria, fungi, protozoa, mites and many others. Some of these organisms can be purchased and added to the soil, but unless the environment is suitable for them, they will languish. Better to create an ideal habitat by providing the food (organic matter), air and water they need and let them thrive on their own. Adding compost will improve almost any soil. The texture of silty and clay soils, not to mention their nutrient levels, are radically improved from initially having the compost mixed in. All soils get better with annual applications on top. Organic compost can be purchased by the bag or by the yard, or you can make it yourself at home. Compost and other organic materials hold soil particles together in aggregates and help to retain moisture. They also absorb and store nutrients that are then available to plants, and compost is a food source for beneficial microorganisms. Making your own compost can be as easy as piling brown layers (straw, leaves), and green layers (grass clippings, livestock manure, food waste) on top of one another. Keep the pile moist and turn it often. If a pile is too messy, or you are concerned about rodents and other animals getting into your pile, there are all kinds of composters available for purchase to contain your vegetable scraps and make turning a cinch. Organic (straw, hay, grass clippings, shredded bark) cover the soil and insulate it from extreme heat and cold. Mulches reduce water loss through evaporation and deter the growth of weeds. They break down slowly, enriching the soil with organic matter. Visit the Clemson University Cooperative Extension Service for an in-depth discussion of mulch and mulching techniques. Inorganic mulches (pebbles, gravel, black plastic, landscape fabrics) will prevent rapid evaporation and keep weeds down just as an organic mulch does. Unlike organic mulches, they do not need to be replaced every year and will not attract insects and rodents. However, inorganic mulches do not benefit the soil by breaking down and adding organic matter which improves soil structure and nutrient content. If you’re looking to improve your soil structure, use a clean, seed-free, high-quality garden mulch. Dry or liquid fertilizer can add nutrients to the soil that might not get there any other way. Organic garden fertilizers work a little slower than their synthetic counterparts, but they release their nutrients over a longer time frame. Additionally synthetic fertilizers are bad for the environment and can make the soil worse in the long run as beneficial microorganisms are killed off.Organic dry fertilizers are mixed into the soil according to the directions on the label and then watered. They work more slowly than liquid fertilizers, but last longer. Fertilizer blends contain different amounts of nitrogen, phosphorous and potassium. The ratio is listed on the label (for example 5-10-5). Other fertilizers may contain bat guano, rock phosphate, molasses or other ingredients. There are dozens of recipes for making your own organic fertilizer. Most are variations on nitrogen-phosphorus-potassium theme with added nutrients that come from seed meals, ash, lime, greensand or other mineral dusts and additional organic materials, often kelp, leaf mold or cured manures. You can find good basic recipes here and here. Liquid fertilizers are sprayed directly on the plant foliage or onto the soil. Popular organic liquid fertilizers include fish emulsion and seaweed blends. Compost teas are another liquid fertilizer that is easy to make and takes advantage of the compost you have piling up in the yard. If you are using a foliar spray, be sure to wet the underside of the leaves. This is where the stomata, the microscopic openings that take in gases, are located. As they open to let in carbon dioxide and release moisture, they will quickly absorb the fertilizer. Read the labels of the liquid fertilizer you choose as some could burn crops and should be applied only to soil. Cover crops are a temporary planting, usually sown in the fall, that help protect the soil from wind and erosion and add valuable organic material. They also establish a dense root structure that can have a positive effect on soil texture. Cover crops also suppress weeds, deter insects and disease and help fix nitrogen. When the crops are turned into the soil, they become green manure (see Overview of Cover Crops and Green Manures). Rye and alfalfa are common cover crops. Cover crops are planted at the end of the growing season (winter cover cops) or during part of the growing season itself (summer cover crops). Legumes such as cowpeas, soybeans, annual sweetclover or velvet beans may be grown as summer green manure crops to add nitrogen along with organic matter. Non-legumes such as sorghum-sudangrass, millet, forage sorghum, or buckwheat are grown to provide biomass, smother weeds, and improve soil tilth. Winter cover crops are planted in late summer or fall to provide soil cover during the off season. Choose a legume crop for the added benefit of nitrogen fixation. Growers in northern states should select cover crops, such as hairy vetch and rye, with enough cold tolerance to survive hard winters. Many more winter cover crops are adapted to the southern U.S. Cool-season legumes include clovers, vetches, medics, and field peas. They are sometimes planted in a mix with winter cereal grains such as oats, rye, or wheat. After you have harvested your summer crops, add compost and any other amendments (such as lime) that you have determined your soil needs. Disperse the cover crop seeds and rake lightly. If you grow vegetables into the fall, plant cover crops seeds in between the rows a month or less before you expect to harvest. Don’t let your cover crops go to seed or they may prove invasive. When spring comes around, till the crop into the soil 2-3 weeks before planting. A rototiller is an easy way to incorporate cover crops into the soil. Don’t plan on changing the pH of your soil with one dose of a wonder material. As explained at Savvy Gardener.com it should take a season or two to moderate the pH and then a little effort every year to maintain it. Whether the soil is acidic or alkaline, adding lots of organic material every year will help balance it out. Acidic soil can be buffered with powdered limestone added to the soil in the fall. (Autumn is the primetime to do this because it takes several months to work). Be aware that plants like azaleas and blueberries grow better in acidic soil, but most plants don’t. To raise the pH of sandy soil by about a point, add 3-4 pounds of ground limestone per 100 square feet. For loamy soil, 7-8 pounds of limestone per 100 feet should help, and 8-10 pounds per 100 feet is appropriate for heavy clay soil. Limestone should be applied at least two to three months ahead of planting to give it time to work. Wood ash can also raise the pH of soil, but care must be taken in its use. Applying too much wood ash may result in high pH readings and take nutrients from your soil. Spread only light amounts on top of your soil in the fall and make sure to thoroughly turn the soil in the spring. Seeds that come in contact with ash may not germinate. If using wood ash every year, keep a close eye on your soil’s ph and stop using it when the proper reading is achieved. Alkaline soil on the other hand, needs to be made more acidic. This can be done with the addition of sulfur, sawdust, conifer needles, sawdust or oak leaves. In sandy soil you can lower pH by approximately one point by adding 1 pound of ground sulfur per 100 feet to sandy soil, 1.5-2 pounds per 100 feet in loamy soil and 2 pounds per 100 feet to heavy clay soils. To make sandy soil less sandy, mix 3-4 inches of organic matter (like compost) into the soil. Use wood chips, leaves, hay, straw or bark to mulch around plants and add at least 2 inches of organic material each year. If possible, grow cover crops and turn them into the soil in the spring (see cover crops discussion above). If silty soil is a problem, you can improve it by adding an inch of organic material each year. Try to avoid compacting the soil — don’t walk on it or till it unless absolutely necessary. Raised beds are a great way to use silty soil without having to intensively work it. Heavy clay soil will be improved with the addition of 2-3 inches of organic matter worked into it. Then add another inch or more to the top each year. Raised beds will improve the drainage and keep you from walking on it, which can compact the soil. Try not to till unless necessary. Typically, bone meal is recommended to boost phosphorous levels in the soil while blood meal is suggested for raising nitrogen levels. However, both of these are products of slaughterhouses. Fortunately, there are some alternatives. In lieu of blood meal or fish emulsion, try alfalfa meal or alfalfa pellets (sold for rabbit food). Or grow alfalfa as a cover crop to make nitrogen available to plants. Alfalfa also adds a bit of phosphorous and potassium and works well as a compost accelerator. Like alfalfa pellets, cottonseed meal can be purchased at your local feed store and provides nitrogen to the soil. It is pretty acidic, however, so use it in combination with lime unless you want to lower the soil pH. As a substitute for bone meal, add soft-rock phosphate to increase phosphorous levels. As a side note, unless you can find organic alfalfa or cottonseed meal, adding them to the soil isn’t strictly “organic.” Non-organically grown alfalfa and cotton seed may contain pesticide and herbicide residues. 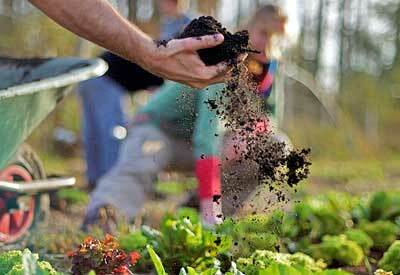 Organic fertilizers will add nutrients without danger from chemicals. Cornell Turfgrass ProgramYour portal to lawn care information at Cornell University. It’s the definitive resource for both turfgrass professionals and homeowners. CSU TurfgrassThe official site of the Colorado State University Turf Program. Practical advice on starting a new lawn, what grasses to use and how best to care for them. Gardening & HorticultureColleges and Universities have some great gardening information. The Colorado State University Extension is one of the better ones. GardenWebAn award winning site, the Garden Web hosts forums, garden exchanges, articles, contests, a plant database, the Web’s largest garden-related glossary and more. Natural Resources Conservation Service (NRCS)Helping people understand soils! NRCS is a Federal agency that provides leadership in a partnership effort to help people conserve, maintain, and improve our natural resources and environment. Soil Science Education Home PageA NASA website with chapters on Soil Basics, Working with Soil, Soil & Agriculture, and much more. You will love this site! Yard & Garden Fact Sheets at Ohio StateMore than 14,000 articles are just a click or two away with answers to your questions on gardening, lawn care, and pest control, just to name a few.